If you’ve been in the library recently, you may have noticed the sea of green tags popping out of the tops of some books. This paper ocean may have been a bit alarming to you, since it is especially dense in some areas. Each green slip reads “THIS BOOK IS TO BE REMOVED.” However, after talking with the Library Director, Dr. Jonathan Miller, the potential of losing all of the tagged books does not seem as threatening. Every five years, the library collection goes through an extensive review. This is designed to keep the books in line with the curriculum and with student use. There are very specific criteria directing the review and removal processes and these operations are completely transparent to students. Decisions made concerning any book are subject to change if interest in the book is expressed by a library guest. 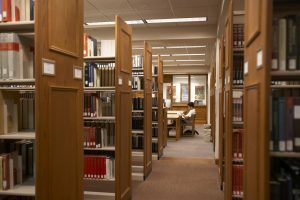 The books being reviewed this semester come from the Language and Literature section (the “P” section) located on the third and fourth floors of the library. It is simply their turn in the continuous cycle of the collection review policy, which completes a full review of every call number range housed in the library every five years. As one may intuit, this is not just a purge of old books. Books are initially tagged for one of five clearly-defined reasons: the book was added to the collection prior to January 1, 1996; the book has not been circulated or used in-house since January 1, 1996; there are more than twenty-five library holdings in the US of the same edition of the book on WorldCat, a global database housing the world’s largest library catalog; the book is not a Choice Outstanding Academic Title, which is determined by Choice magazine, a standard academic review source; the book is not about Florida. After April 1, the books that are still tagged will be transported to new locations. “Any titles that are unique in Florida will be sent to the FLARE (Florida Academic Repository) collection in Gainesville,” Dr. Miller informed. This way, the title can still be borrowed should someone need it. The other books will be sent to Better World Books, an organization with an ethical goal of donating books and funding literacy initiatives worldwide. They collect and sell books online for this purpose. For more information on this organization, you can visit https://www.betterworldbooks.com/. Dr. Miller concluded, “this continuous collection review process is designed to make room for newer titles and to maintain the most appropriate books on the shelves for students and faculty to find.” Clearly, the green-slip ocean is evidence of an efficient and responsible system designed to support a consistently evolving curriculum.